Up until these chases I have already considered 2017 to be my personal worst year for sky section and the most dreadful let down of a thunderstorm season I have ever seen in more than ten years of storm chasing and 15 years of weather photography. Previous to this 2008 would have been my least productive storm season however even it produced a selection of exciting and photogenic convective events which made this year shameful. Storm season is my favourite time of year, my Astronomer side loves the dark Autumn and Winter months however the hunter in me cannot wait for each Spring and Summer to see what wonders mother nature will produce, the storm season has now become my favorite time of year, I simply can't beat that glorious sensation of watching boiling convection on a hot day with the sun tanning my skin while I get ready for a day of chasing in some part of the country yet unknown until the radar comes to life. 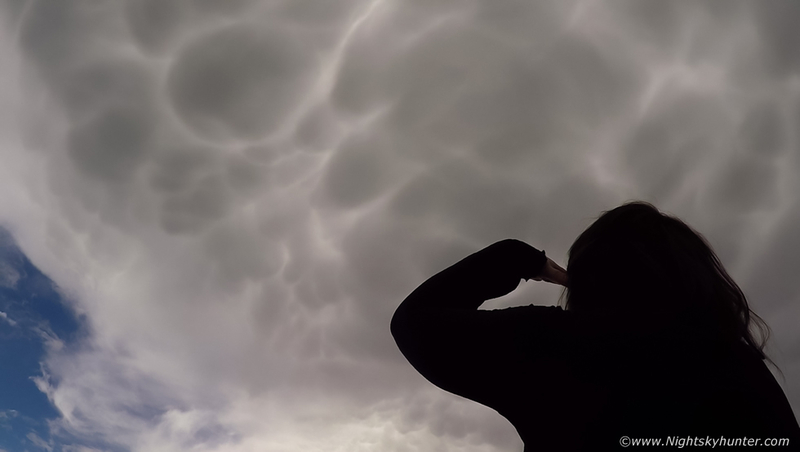 It seems every year has produced something special for me, whether it be exciting storms, beautiful cloudscapes, rotating funnel clouds, mysterious mammatus clouds or epic sunsets. Now don't get me wrong, seldom have any of these memorable events come to my own front door, I earned every single one of them, each catch often evolved countless hours out under the elements in full exposure, many miles on the road, and a lot of money and personal energy. This is why I love storm chasing, the drive into the unknown, the hours spent on the computer before each chase begins studying the models, waiting for every GFS update and refreshing web sites in an endless cycle looking for some tiny jig saw piece in the atmosphere puzzle that could help my decision making process when I'm on the road, the hours and days spent doing this leading up to the actual chase day not to mention the day itself and the rollercoster ride of emotions experienced throughout this process is nothing short of staggering. I always say you can spend an entire season chasing from April to September and if you get one or two photogenic days then this is considered a great success, if you include the entire year through Autumn and Winter convection then you should count yourself lucky to get five days of camera friendly events. The truth is you have to put in a tremendous amount of financial and emotional sacrifice to increase your chances of achieving your convective goals, however when the rewards come they can stay with you for a life time, I enjoy the hunt however I do expect some kind of result when sufficient effort as been made. I'm not a storm snob, I will chase days with no shear and days of good shear, if there looks to be a reasonable chance of something happening and time and circumstances allow it then I more than likely will be be chasing, whether it be local or in another county or even below the border. I have a list in my head of the kind of phenomena I want to catch on camera each season, however at the heart of it all I'm a lover of dramatic cloud structure. I love storms in clean air, I like the structure to be mean, solid, dramatic and preferably filling the wide angle lens when at close range to me, if the subject doesn't fill many of these requirements then I consider the chase a photogenic bust. A daytime storm can rumble as much as it wants, produce a barrage of c-gs, but if the storm is not impressive on camera or photogenic in some manner then my chase has been in vane. I expect to go through many days of let downs and disappointments until I catch something I'm happy with, that is the reality of storm chasing, I have a good idea how many days and hours it takes to get a result. Then came 2017, perhaps my expectations were too high, the 2016 season was epic producing five night time lightning events, extremely active day time storms, amazing storm structure and a beautiful rope funnel cloud. So when the new season began I was rather psyched up and ready and waiting for the first decent outlook. The season turned out to be a damp squib for the most part, at least on a personal level, we didn't have many days to chase at all then suddenly we got the biggest set-up of the season with high CAPE and high shear with a risk of supercells, a night time MCS, big hail etc. Paul Martin and John Fagan and I chased to the W coast and ended up experiencing a grey sky bust. We got our storms, however there was no structure at all, I mean nothing, just grey clouds, the incredible lightning rates were wasted with nothing to shoot. This chase seemed to set the scene for the rest of the season, every set up that presented itself there after was the same result, convection seemed to be always capped in the N of the country, cloud tops were low, and cloud bases were high, there is nothing I dislike more than high based convection, I know from experience that nine times out of ten any storms which did form would be featureless and non photogenic. I spent hours chasing the back roads, I spent hours on the mountains watching every cloud until my eyes hurt from the exposure, I tried shooting time lapse of something, anything that was slightly convective just to pass the time and get something to show for my time outside. It seemed that ever single set up was the same - high based, low topped, capped, and the light was flat and grey. By now it was mid July and I was loosing faith on this season, I hadn't a single photogenic storm cloud captured, I had only heard thunder on one day out of the entire season and even that was distant thunder. I had captured three funnel clouds, on the contrary I seemed to be good at catching those but they where all distant so yet again fell into the non photogenic category. I was starting to feel sorry for myself by this stage and was cursing 2017 at every opportunity and my storm chasing friends shared my frustration, it wasn't just me, the 2017 curse was felt by us all. Something had to break at some stage, we all agreed that July would bring better luck and after a great NLC show on the first of the month we began to sense that the tables may be turning in our favor. 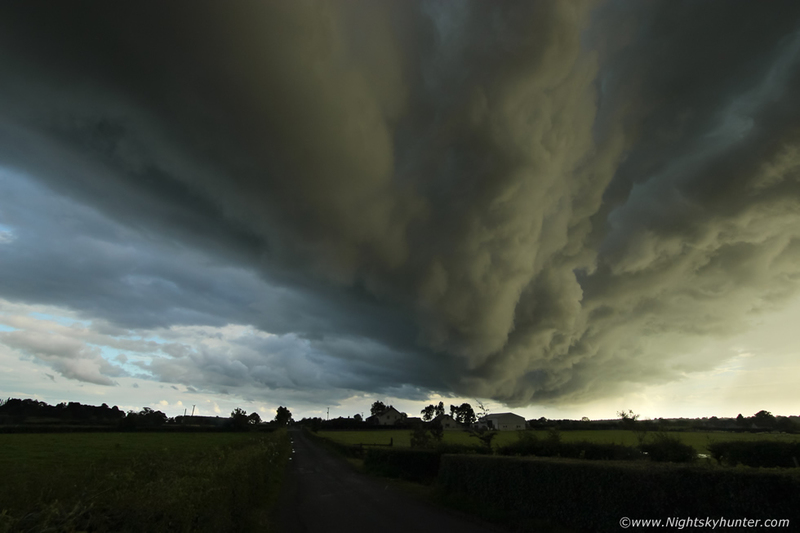 By late July three days produced sheared storms over Tyrone and the Lough Neagh area, I chased local but when I arrived on the scene there was nothing to see but a messy elevated grey base and a sheared anvil, not even worth looking at never mind shoot. Another day produce a better surface based sheared cell but it never produced a single rumble and grey skies and serious rainfall killed any good light. The third day produced the best Mid-Ulster thunderstorm of the season over Tyrone yet again on the leading edge of a trough, I chased out the Ballyronan Road and intercepted it head on before the storm crossed the Lough, it was producing a serious amount of thunder, the rumbles sounded like a huge monster lurking within the rain, there was also a partial double tier shelf cloud on the leading edge however it looked rubbish in the wide angle and was more of a naked eye joy, I ended up with nothing photogenic at all from this chase again with more money and diesel wasted, however if I'm to be honest I did love the sound of that booming thunder and the high speed chase itself got my blood going, I was starting to get the bug again, I felt I was getting closer to something good, my hunger for storm clouds grew as strong as it ever had been, I couldn't wait for the next set up. 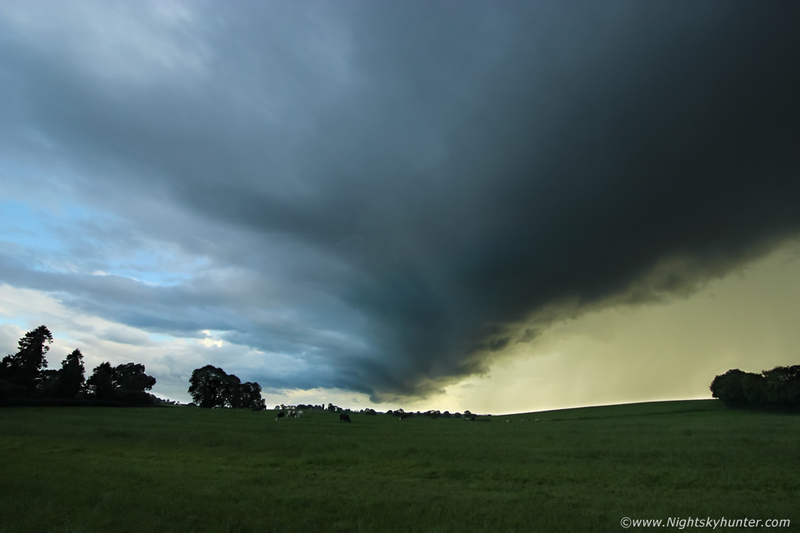 July 30th brought a new risk of thunderstorms and I was eager to chase. 600 CAPE, -30 C air aloft, good lapse rates and decent solar heating, there would be no decent speed shear though so any storms would be pulsey or pop corn in nautre. However high resolution models indicated sea breeze convergence along the N and NW coasts which could be a focus point for storm formation and funnel clouds, perhaps even a waterspout, furthermore models indicated the strongest precip and hence cell chances to be in this very region so it seemed like the coast, Limavady and Lough Foyle areas would be a good place to target. 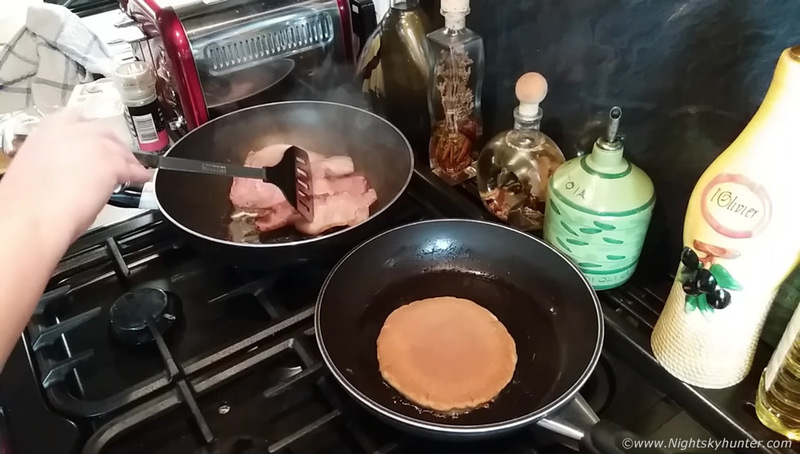 Roisin and I got up early, made a flask of tea, filled water, snacks, I fully charged by camera batteries and cleaned all lenses then Roisin made us a delicious fry which would help keep us going for much of the day. By 11am we where on the road, the sun was shining and convection was already forming, the plan was simple, this wouldn't be a chase as such, more like a day of spotting by placing ourselves in an area with a good view where things could possibly develop later. Charts showed CAPE leaving the area by early evening so we had until late afternoon to catch something on camera. I was eager to see something photogenic and I was hoping to get shooting time lapse on location. We arrived at the coast after 1.5 hours of driving, ordered two lattes then drove onto Benone beach which I considered to be a good location, here we would spend the next few hours. The day was beautiful, fresh, golden sand, deep blue sea, heavy downpours sent people running for cover however once the cores passed it was back to sunshine and good times. Just as I finished my latte I glanced behind me to the SW towards Binevenagh when I immediately spotted a new cell heading our way. I liked the look of it, mean clouds, very dark sky, and at last some structure!, I was actually overjoyed to see convective cells that looked good, it had been months of chasing and now I was actually seeing something to aim a camera at. I set up the DSLR and 10mm lens on the tripod and began shooting time lapse with the camera taking one image each second. I drank what was left of my coffee and chewed on an protein bar to keep my energy levels up, I have to admit at this stage I was rather pleased, this scene alone had already validated the trip, I was back in the storm buzz again loving every second of this, sun shining on me, standing on a beautiful beach, sea gently swooshing onto the sand and people enjoying themselves while storm clouds built and organized. The cell formed a very interesting small and compact shelf cloud on it's leading edge which was almost touching the ground and sand dunes, this was of a much better standard and more of what I had in mind, solid structured surface based convection was happening and the camera's shutter was clicking away. The cell with low shelf cloud made for quite a sight as it ploughed through the air just above the surface getting ready to give the beach walkers a fresh hair cut. 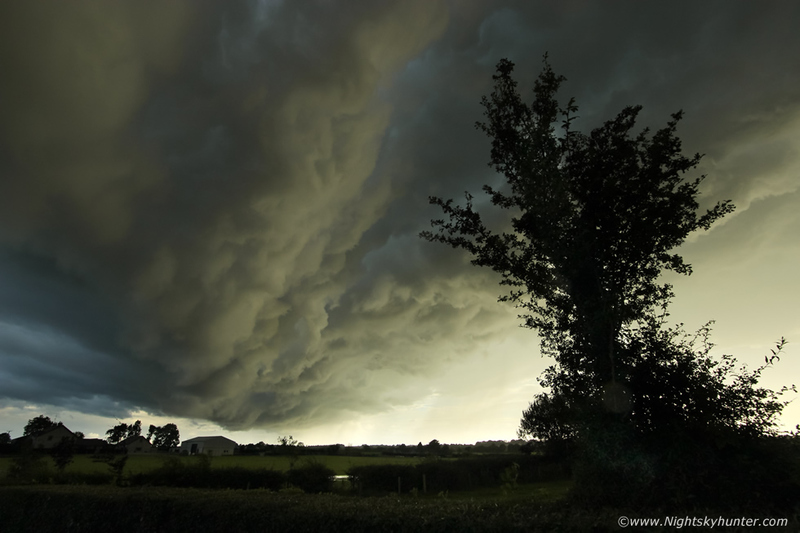 Rain cooled air descending from the core was scooping up warm air ahead of the cell which condensed forming this low cloud formation, the cloud tends to have a face-on linear shape in a horizontal aspect so hence the shelf cloud name. Raindrops began to fall and my lens was starting to catch the drops which would end up hindering my time lapse however I let it continue on shooting a little longer then suddenly it was as if an invisible switch was flipped and the heavens opened, the gust front had passed and the precip core was now approaching, heavy rain soaked my camera and t-shirt, I ran back to the van to seek shelter inside, I hoped I had enough frames taken to make a short time lapse. 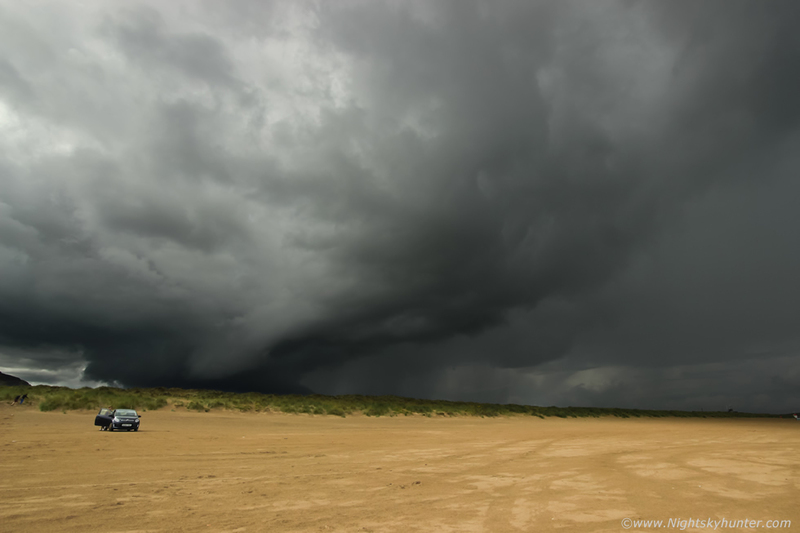 We sat inside as torrential rainfall hit the beach, the rain was so heavy it made a rumbling sound on the sand and was even louder inside the van. The cell produced a red and white core on Netweather radar indicating rainfall totals at the top of scale and because of the cell's slow movement it stayed over this area for some time, these downpours posed a serious risk of flooding if they continued to develop later during prime heating time. 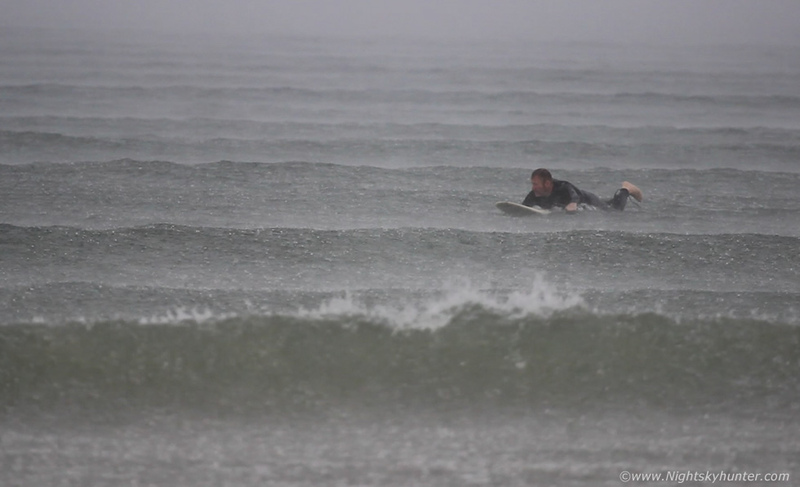 Meanwhile I attached the 100-400mm lens and began filming a surfer/body boarder training on the waves while intense rainfall pounded the sea. 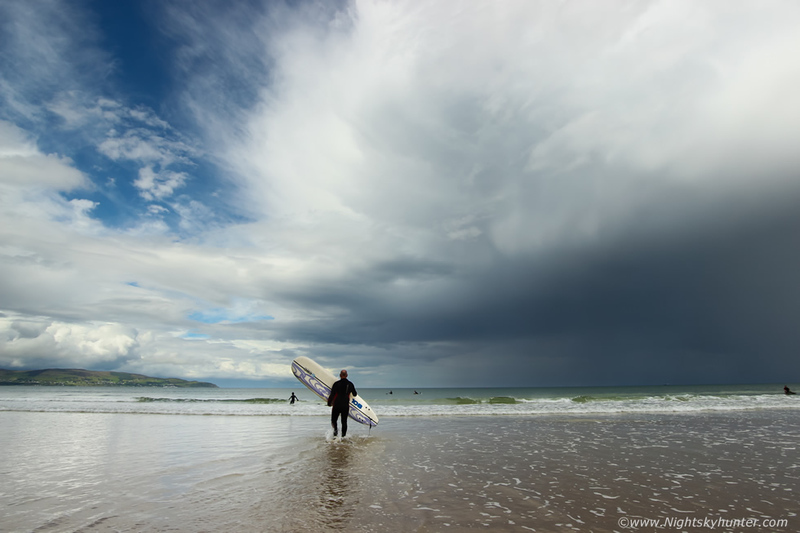 Once the cell transitioned from beach to ocean we could see the flanking area catching the bright sunshine with anvil aloft, the surfer was going back out for another go, this time it was a much more enjoyable experience. When the sun came out the sea turned into the most stunning green colour we have ever seen, this image doesn't do it justice however visually it was a remarkable sight, we went for a walk along the beach and people even stopped us to comment on the vibrant green colour. More cells where developing inland evident by their eye catching anvils dominating the skyline, some of these cells were thundery. 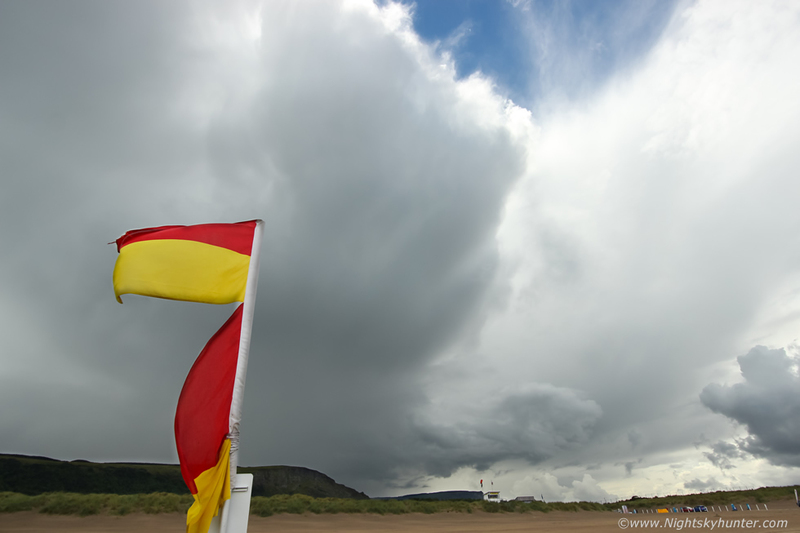 We waited another hour at Benone where I shot a second time lapse sequence of storm clouds crossing Magilligan Point heading for open sea then just as things were looking good for something big during prime heating/CAPE time the sky closed in, it turned overcast with flat featureless grey clouds and the rain began, it rained and rained, this was barley convective anymore, it felt more like enhanced stratus. 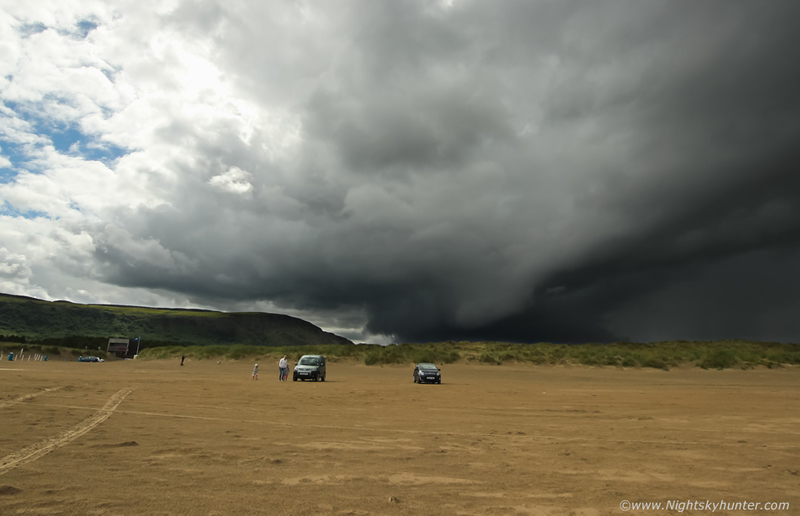 After a patient wait we relocated to Gortmore viewing point on Binevenagh where we got soaked by yet more rain which lasted another hour, it was now clear this chase was over, cloud cover and rain cooled air had shut off solar heating so convection would no longer fire in this area. By 18.00 we went for dinner and finally the rain cleared so we went for a walk to the cliff edge beside Mussenden Temple where we watched distant updraught towers growing in the late evening sunshine over Donegal and crossing the ocean, I watched their bases intently for funnels then when I satisfied myself that I could see no rotation or inflow motion I decided to call it a night, I had come home with 744 stills taken. 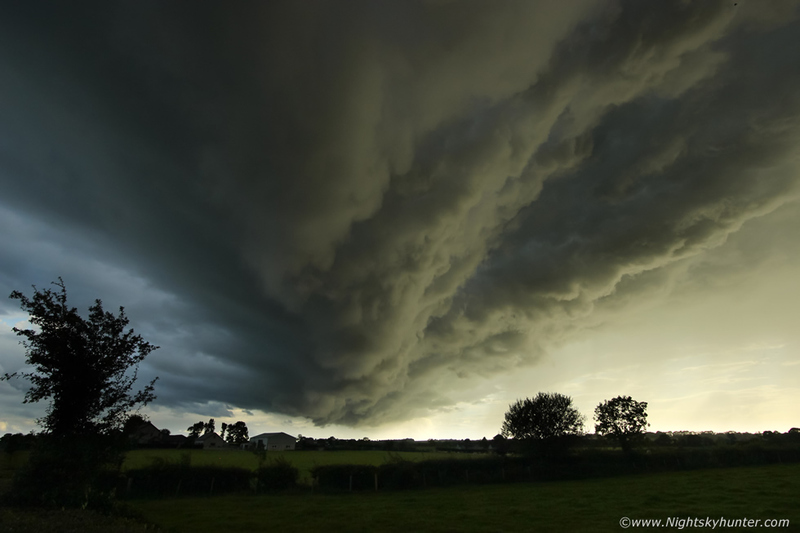 Roisin and I drove to Maghera and called in with my Mum, and that's when I heard about the big thunderstorm I had missed. Mum informed us there was plenty of lightning and thunder, so loud it shook the house!, images also came in from the same cell crossing Portglenone where photographer Colleen Webb captured nice in-cloud lightning. I have to stay we were shocked, none of the models indicated Maghera as a better storm area, in fact, they all screamed the N coast, I have to say I felt absolutely gutted, not only was there a good storm but it happened rite over my house, we could have spent the day here at no coast and got a nice storm along with a brew, now that would have been handy. I have to say I felt cheated by nature once more and I seriously began to question my forecasting and my instincts, it seemed I couldn't do anything rite this season, to miss a storm over my home area was a tough blow, especially after being out for eight hours at the coast and not hearing a single rumble of thunder. Later this night I decided to change my attitude, I even laughed at the whole scenario, I looked at the positive side of things, judging by the images I had seen online of this storm it appeared there was little or no structure at all, the lightning was the main aspect, so in that context Roisin and I ended up doing very well indeed, we got storm structure, perhaps the only good structure of the day and time lapsed also, this ticked my boxes more than the lightning. My hunger for even better storm structure was getting so strong I could taste it, I was now extremely motivated and it looked like nature was going to offer me another chance to redeem myself the following day with an even better set up, I charged my batteries and focused my mind, tomorrow I was going to be at my best. Roisin and I stayed overnight in Maghera as I believed it would be a good target area the following day, I suspected that here and the Sperrins and Co. Tyrone could produce nice cells so it would be wise to camp near the Lion's den. The outlook looked considerably better than the previous day with 800 CAPE, -30 C air aloft and excellent lapse rates, surface convergence in the Mid Ulster area and 30-40 knots of deep layer shear. The latter meant there would be a clear separation between updraught and downdraught allowing storms to become organized with much greater life cycles, the shear and surface convergence also introduced a chance of funnel clouds and weak tornadoes from any strong surface based updraughts. My target area proved to be a good one, on July 31st we were preparing to hit the road and chase, and it was only midday. A sheared linear complex of cells had formed across the country extending all the way from Enniskillen to the Sperrins while moving NE, the component cores were radar on radar and seemed to be intensifying with each update. Roisin and I hit the road, we drove along Glenshane to get a visual and parked behind Oak Leak filling station at the bottom of the Pass. The leading cell in the line arrived within minutes accompanied by a huge core of water and a few minutes later thunder rumbled, then another rumble, and again another, we had a storm!! !, the decision to stay here was a good one, my target area had been perfect, give or a take a mile or so. At last it seemed the curse had been broken, we had a storm over my home area and it was game on, it was obvious this storm was high based and had no structure so we decided to punch the core instead for a little fun. We chased the storm S along Glenshane Road, upon entering the core the visibility dropped to a few meters thanks to an absolute deluge of rain, some cars pulled onto the shoulder to escape and eventually we did too as we wanted to watch the lightning. 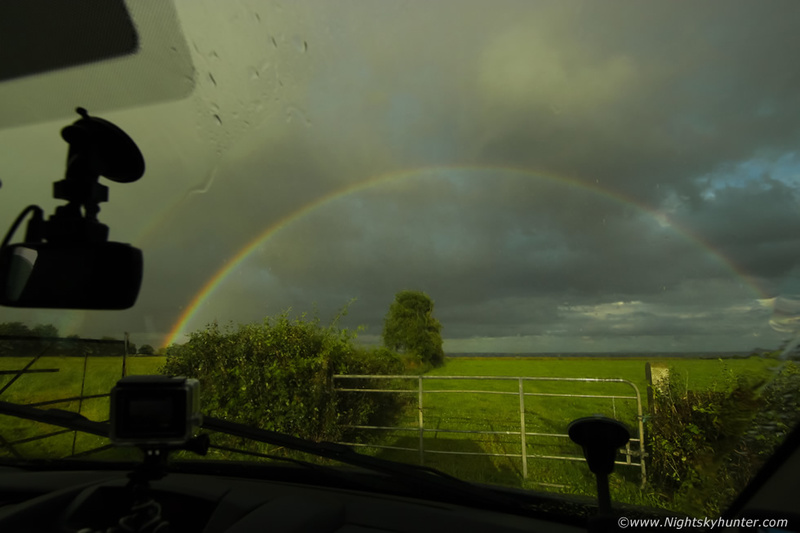 We had a great period of lightning and prolonged thunder with the torrential rain, Roisin was filming with her phone, I was doing similar with my own phone and the Go Pro was faithfully recording from it's window mount. All of the lightning was embedded inside the precip and was of the in-cloud variety which made it very difficult to catch on camera, we only observed one c-g however we didn't mind, we where under a storm and enjoying every second of the experience, I was in the zone and feeling sharp, my decision making was bang on and I was feeling like I was flowing and my old self once again. We started the engine and took the narrow back roads to get more sparks, the road was flooded in many places with fairly deep flood water extending from one side of the road then the other, the water sprayed high into the air above the wheel arches which added to the excitement, eventually we could keep up with it no more so we turned at Castledawson then rejoined the Glenshane road. We drone back W and soon a clearance formed in the distance in the wake of the storm. One of my favourite places is at the flanking area of a storm for this region potentially can offer a vast range of photogenic wonders such as updraught/flanking structure, wall clouds, funnels, tornadoes, rainbows, anvils, mammatus, and all of these can look exceptional if the light is warm and contrasty. Given that this was a high based cell the chances were small of anything special however we decided to give it a go, we chased along the road which was already evaporating under the sun with steam rising then I suddenly looked out the window and spotted mammatus clouds, I pulled over onto the next good stretch of hard shoulder I could find and got out to shoot the scene. 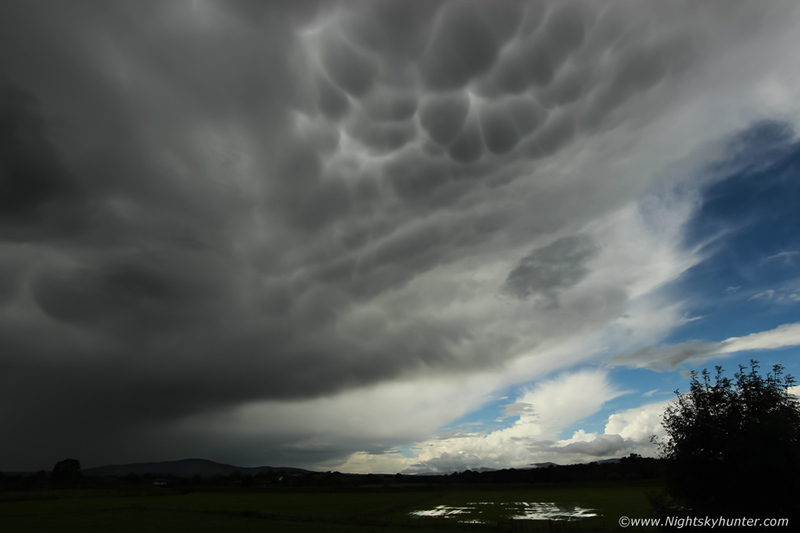 Facing S at 10mm wide angle, storm anvil moving R to L, mammatus pouches clearly visible and getting better by the minute, in the distance within the blue sky you can also see a sheared anvil miles away in the direction of Omagh. 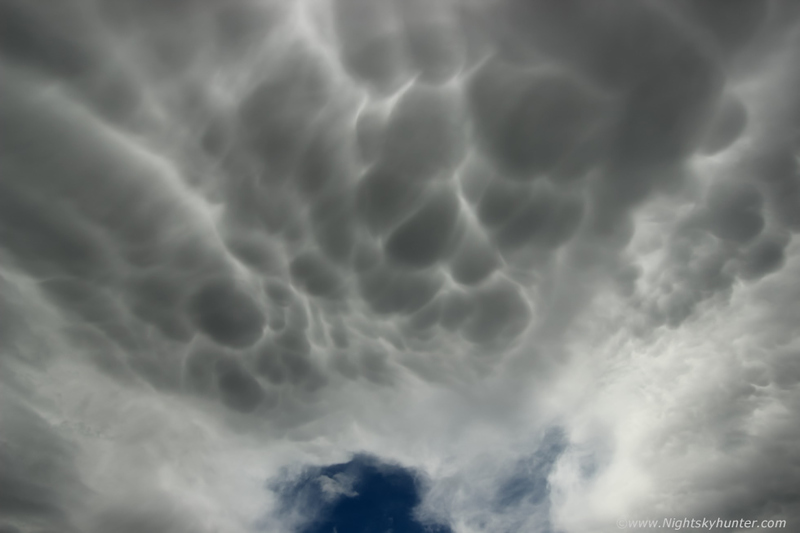 This quickly transformed into the best mammatus display I have seen in years, much of the local sky was covered, this was at the zenith, again at 10mm. A complex of large grey udders under the anvil with blue sky to the W made for stunning sight, I called Roisin out of the van, she had to see this, she was as impressed as I was. Roisin began shooting stills and video with her phone while I grabbed my tripod and began shooting a DSLR time lapse facing overhead, the display was moving slow so I had some time to work with. 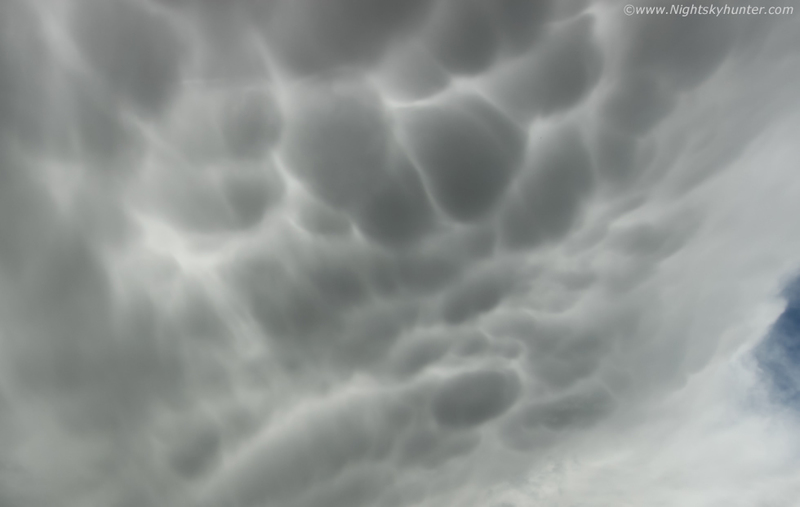 Cars rushed past us at close range while my camera's shutter began clicking every second, this was the first time I had ever attempted a mammatus time lapse. 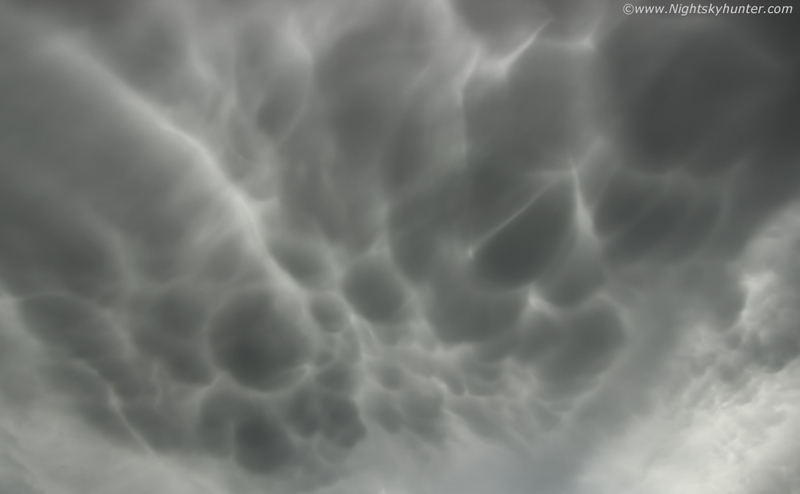 Despite the grey colour the scene was remarkably contrasty, it was really difficult to do justice on camera however with the naked eye it really was an impressive sight, this was still overhead with the udders slowly drifting to the R, the anvil must have been very tall, the bright white divisions between udders were just as interesting as the mammatus themselves, the pattern on the mid right reminded me of a hot cross bun. I adjusted my camera position three times and kept shooting time lapse, I hoped I had enough to get some kind of footage. Meanwhile I was also taking clips with my phone, this was looking S again. I grabbed my Go Pro and took footage of Roisin looking skyward at the display which I think added a sense of scale, this is a still from the footage set at the 'medium' FOV setting. DSLR now turned N to catch the clearing mammatus and anvil, 10mm once more, I reckon you can appreciate how much sky these took up in this image, I let the time lapse finish here. Roisin and I were on a high, not only did we get a storm but we also got this fabulous treat and it wasn't even half way through the chase day, to be honest we were happy enough to catch this, had there been nothing else for the rest of the day then I would have called this a success and felt content. We ended up chasing two more cells during the late afternoon, I time lapsed a non electrified cell approaching Glenshane road, this time further W, and later another lapse from the hill near Knockloughrim however by this stage everything was grey, rainfall rates were high, cool outflow was destroying the heating and despite their being occasional cells everything was looking cold and slow and the charts showed no new sferics anywhere in the country for the last hour, it seemed the show was over. Before we called it a day I time lapsed another departing anvil near Maghera with an horizon hugging rainbow then called the day done, it seemed that we had got the best this day had to offer so during rush hour we made our way S through heavy rain then arrived at Cookstown to have dinner and wind down for the evening. Little did I know that I would be chasing again and that the best was yet to come! By 19.00 Roisin and I where in Cookstown enjoying one of her amazing curry dinners, just as I finished I checked radar and saw a new prominent cell in Co. Tyrone located SE of Omagh, it was extending SW to NE in a line and clearly very well sheared with a row of cores which were red then white within one update, they were slow moving and seemed to be back building and the N end of the line was heading for the general direction of Cookstown, I kept a very close eye on it. Half an hour later the rain arrived blocking out the bright western sky, the rain had a strange warm coloured glow about it from the low evening sun which immediately got my attention, I suspected a photo opportunity was about to happen, just as I was thinking this a big rumble of thunder echoed throughout the neighborhood, we now had a storm. I shouted upstairs to Roisin asking if she wanted to go chasing, I was honestly expecting her to say no after the hours we had spent out earlier however she agreed which was a good omen. We ran outside into the pouring rain and I quickly packed my camera gear and drone into the van and hit the road. The problem was which direction to go?, Roisin suggested Tullyhogue ring fort which was an excellent viewing location, however that would mean driving through town and being held up by traffic and by the time we got to the fort our chance could be gone, I hate built up areas when there are storms brewing, I need a good horizon and fields to improve the photo potential, chimney tops and aerials wouldn't cut it. On an instinct I decided to take the old Coagh road which would take us E moving in the same general direction as the storm, at least here we would be in the countryside and see things, however I knew from previous drives here that the road was narrow and hazardous with limited places where we could safely pull over, however we decided to chance it. The original plan was to get to the back of the storm when the sun broke out in the hope of another mammatus display or even a spectacular rainbow which I could film with the drone however for some unknown reason I just kept on driving feeling fixated with the storm, I was flowing again so I just went with it. We drove through the precip core and got hammered by blinding rain for 15 min's then punched through the other side when I spotted heavy clouds coming into view through the misted windscreen, I realized the storm was moving so slow that I actually had out ran it, now there's something which rarely happens in N. Ireland, storms usually move fairly quick here, in fact, this may be the first time I have ever caught up with and got ahead of a notable Summer thunderstorm in this country. I then saw storm structure on the leading edge of the multicell so we chased on, the idea was to stay ahead of it and make some time and get in a good position with a nice flat view to shoot its approach. We kept driving at a swift pace through the narrow roads but no matter where we looked we couldn't get a decent view, there where no laybys, no grass verges wide enough to accommodate a car, hills galore blocking our view of the storm and plenty of telegraph poles and power lines ruining any photo potential, we chased further S and E into the outskirts of Coagh. Out the driver's side window I could see mean storm clouds coming into view, this was the strongest southern most cell in the line, it's what chasers call tail end charlie, a cell at the rear which was free to ingest warm moist air and feed new inflow into the storm making it a healthy target, this is the place to be for structure and tornado potential, I didn't see any vortex phenomena however what I did see was a big gust front on the leading edge of tail end charlie, I realized in a second that this was the best scene I had witnessed all year, I wanted to pull over and shoot it rite away, but same problem, hills, poles, very tall hedges and trees blocking any decent shots, we raced on, met a fork on the road and took the right option and ended up on a bending tight road with barely enough room for one car never mind two, but I was on the jazz as Hannibal from the A-Team liked to say and wasn't going to let the chance pass. We pulled into a narrow grass strip at the side of the road so tight that hedge branches were protruding into the van and I was out on the road with the DSLR, a steep hedge blocked my view so I had to climb up this tall ridge with one leg on the top of the bank and the other rested on a wire fence, I was able to get the camera high enough over the barbed wire to get shots. These are all with my trusty wide angle 10mm lens, the gust front can be seen approaching from R to L over the lush fields and a few grazing cows, the entire structure was under lit by the sun and was looking superb, as it got closer to us I could see nice structure under the gust front catching the sun, thunder boomed loudly from inside the dense core, and boomed again, Roisin and I were loving it, we were on a high. The underside now looked potentially epic however we were about to get rained on and loose visibility and our positioning was slightly off, we needed to be a little more S and E so we raced back to the van and where on the road once more. We raced along the back roads and got ahead of it by a few minutes lead time, I want going to fall into the trap of driving for another half hour looking for a good place to pull over, we approached a hill which looked full of promise, I said to Roisin ''I don't care what's on top of this hill, I'm pulling over! '', I reached the summit and pulled onto the side of the narrow road a few meters down from an isolated country house, I looked to the sky and yelled ''get outside quick Roisin and get shooting!''. I yelled ''Holy S**t' out loud, not to anyone in particular, more to myself, I had to get expressing how I was feeling, the sky beside us looked absolutely epic! I couldn't believe my luck, this was the kind of structure I had been after all year, I was in the zone again taking constant stills checking my exposure, composition and horizon and depth of field, I was on ISO400 here with a fast 10mm lens stopped down a few clicks, the exposure looked perfect and matched what I was seeing very closely. 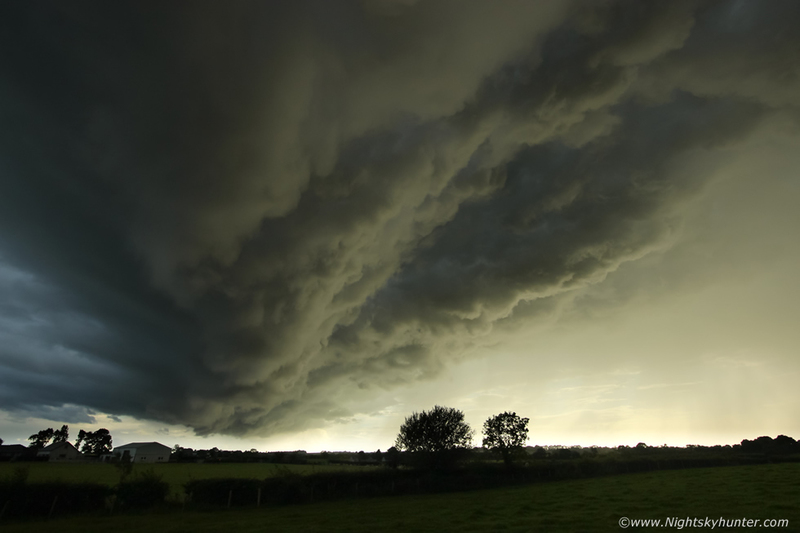 Monster gust front sweeping slowly across the flat fields lit by the low evening sun while thunder rumbled with anger in the core beside us, amazingly our positioning was absolutely perfect once again, we where in the countryside on a hill looking across miles of flat fields and we were dry, no rain falling on us at all so we had a lucky few minutes to shoot 'dry stills' before the core caught up with us, gust front moving R to L. What made the visual experience even cooler was the farm house and barns sitting directly under the nose of the guster, it felt like we where on the great plains of the US, the barn also offered a great sense of scale for the shots. To say I was in my element would be an understatement here, this was the kind of thing I live for, this moment in time when nature was revealing something special and by great fortune I was at the rite place at the rite time to experience it and furthermore get it on camera in great light, I was on fire this day and pretty sure I was doing a lot of cursing. 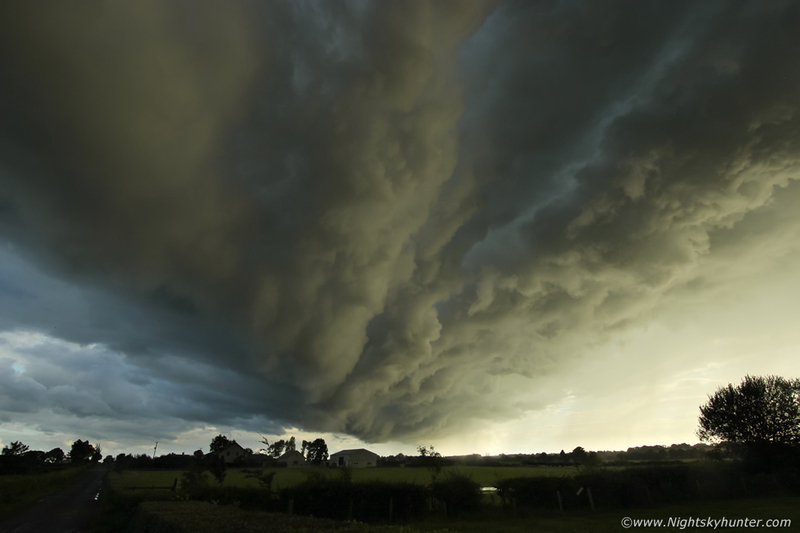 You can almost visualize the massive downdraught blasting down from the core sweeping across the surface and lifting the warm moist air ahead of it forming this remarkable cloud structure, you can even see steamers of cloud ahead of the mouth caused by the outflow winds surging horizontally aloft. Epic structure rite here, the entire gust front stretched from the S, overhead, and into the N, however I concentrated on this S side as it was the most photogenic and the horizon was perfect. This was the structure of the year for me, perhaps the last two years, it ticked all my boxes, huge, dramatic, solid, wow factor, good light and filling the wide angle frame, Roisin had never seen cloud structure like it in her life before, she was shooting away with her phone while I kept my Cannon shutter busy too. The downdraught had not reached us yet so the air was calm and the atmosphere warm and humid, there is seriously nothing I like more than standing outside in a t-shirt with my base ball cap shooting a stunning Summer thunderstorm, these were precious moments, this was the kind of structure I hunted for. I wonder if the farmer was inside the barn, I could imagine him hearing thunder then stepping outside to check the sky and seeing this monster rite over his farm. The first drops of rain began to fall on my lens and the core with thunder was almost on us, we would need to move soon. 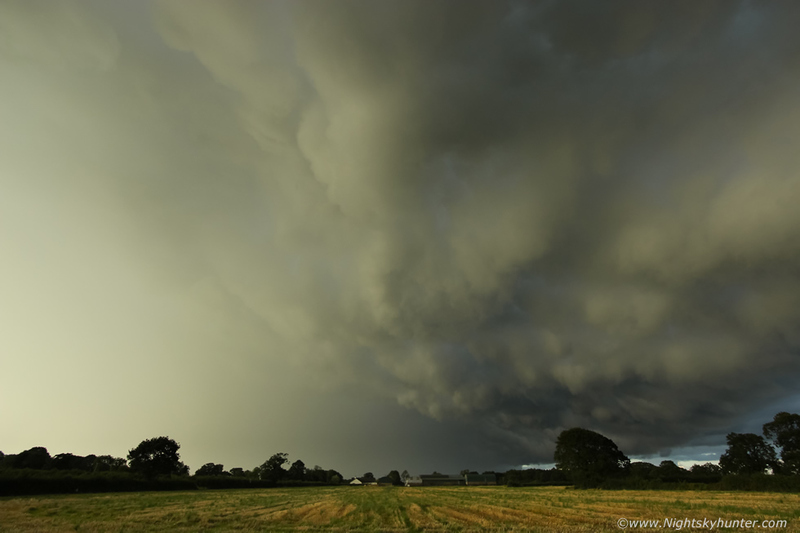 The gust front was surging well in front of us now so it was time to move, I would make one more attempt at catching up with it, I was already blown away by what I saw and delighted with my images so anything else would be a bonus. I didn't know precisely where I was, I had never been on this road before in my life, we drove on, a chase is a chase, discovering new roads and new parts of the countryside is all part of the experience. The rain began to blind us once more so we increased our speed and just about got ahead of it, Roisin yelled to look at the sky on her side, the N side of the gust front had now come into view, we needed to stop again, my mind was in top gear, racing, thinking, I trusted my instincts, there was a road to the L with a dead end marked on the sign, I took it and arrived at the end as far as I could go, it was a good decision, the view we had was of acres of beautiful freshly cut fields lit by the sun and beyond the hedge was the W side of Lough Neagh. We got out shooting once more, huge gust from moving L to R over the fields. 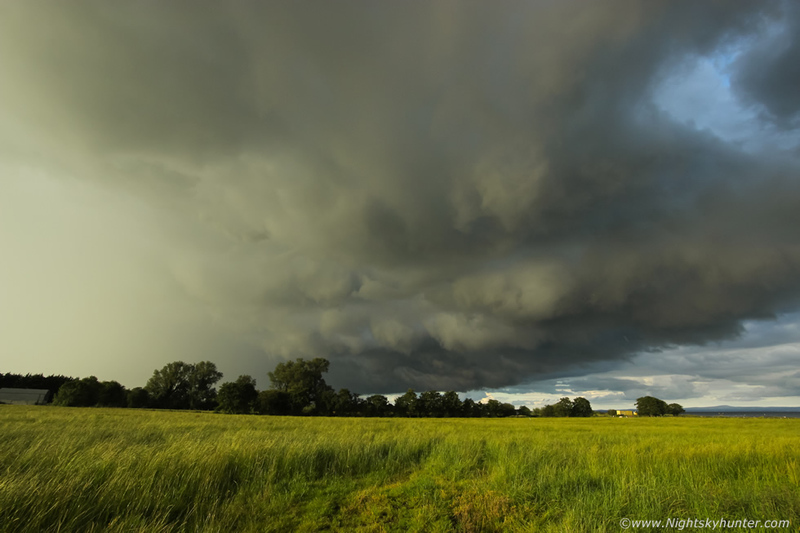 What a sight, mean cloud structure over a beautiful field with the sun breaking out from the side of the precip core while thunder still rumbled breaking the silence of a peaceful Summer evening. 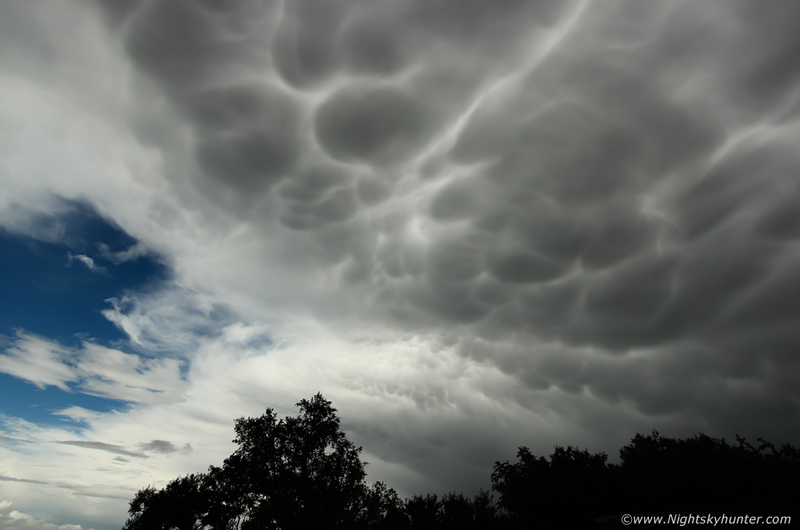 This was all outflow driven storm mode here, those clouds were being sculpted by turbulent air sinking and blowing forward, there was no tornado risk here or a funnel cloud, these were simply amazing clouds engineered by nature and made to be marveled at. The core caught us again and hit us hard with torrential rainfall which was so loud we could barely make out the close range thunder overhead, then as the core eased the sun came back and produced this long lasting primary and secondary rainbow as the storm crossed Lough Neagh heading for Co. Antrim. There where a few houses in the area and it wasn't long before we drew attention to ourselves, who where these strange people in a black van running around with cameras?, a car pulled up and the owner asked what we were doing, I explained we were taking images of the thunderstorm, I don't think he actually believed me, or maybe he didnt realise people chased storms in this country, I explained once more that we had chased this storm all the way from Cookstown and followed it here, we needed a good open view of the storm away from hills so we took this road so we could get a few images, I think he believed me at this stage and said that's OK as long as he knew what we were doing. We were on a high during the drive back, you know that incredible buzz you get when you experience something special from nature, like an epic aurora or footage of a crazy blizzard, that healthy glow was what we were feeling now, we talked about the storm all the way back. I have to say this was the perfect storm chase, it reminded me of the chases I used to have years ago when there was non stop action, this chase had it all, the unexpected late evening chase with the decision made within a few minutes on an impulse, the frantic drive through the back country roads, dogding hills and poles, racing to stay ahead of the storm them getting exceptional storm structure in great light over a perfect view, that combination and the emotions which went with it made this into a memorable event for us, I would rate this as one of my most successful recent storm chases of the last few years, everything was perfect. 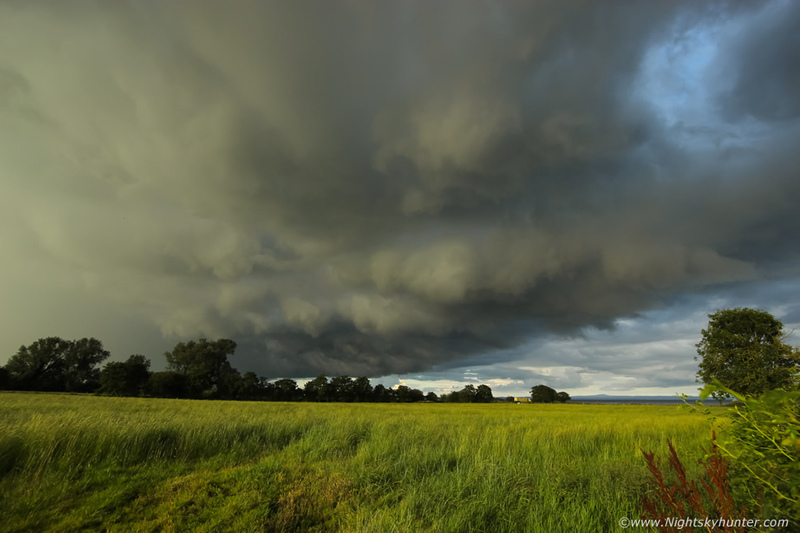 Chase video documenting the July 30th Benone time lapse, downpours and the July 31st Glenshane mammatus display and Coagh gust front, these are a combination of DSLR time lapse, Go Pro Video, DSLR video and mobile phone footage, thanks very much for reading.